The brilliantly named Heath Frisby just put himself in the record books by landing the world’s first frontflip on a snowmobile. Nutter. 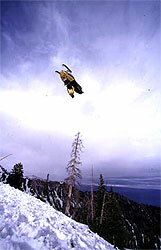 Heath’s feat at the Winter X Games Snowmobile Big Air (yes, there really is a big air for sleds these days!) earned him a gold medal and puts him alongside legendary 90’s snowboarder Jim Rippey, who was the first person to land a backflip on a snowmobile. Difference was, Jim did it into powder and then found god (seriously, he’s a preacher now). Check out the run which won Mark McMorris his second gold in Aspen.